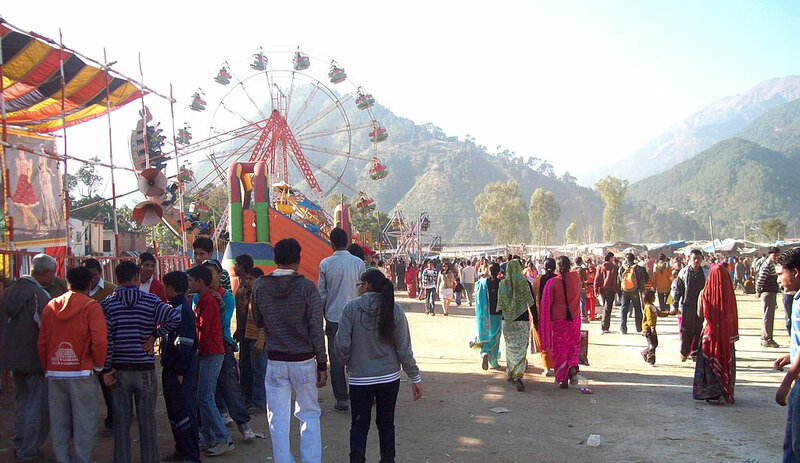 It was with great eagerness that Tara awaited the annual village mela, a four-day affair. She had even bought three raffle tickets, one in her name, one in Shyama’s, and one in her husband’s. One can imagine her disappointment when, on the first day of the fair, her monthly began. Now, Tara considered herself a modern woman, but there were some rituals she stuck by. On the first three days of her period, she ate and slept by herself, left the cooking to Shyama (lest the food should spoil), and washed her own clothes. Of course, the mela was off limits, but at least she could go on the last day. Every evening, while Shyama cooked the evening meal, Tara listened to her niece’s narration of the goings-on at the mela. On Friday, there was a fight between two boys on the moonwalk machine. Two tall foreigners had a stall of their own, and the locals took pictures with them. On Saturday, one of the shopkeepers sold chhole bhature for lunch, but one of the gas cylinders caught fire and everyone ran away, except for one brave man who hauled the flaming cylinder from the inside of the shop to the middle of the road. On Sunday, the crowds were at their most dense. People from surrounding villages thronged to purchase items and take part in the festivities. Come Sunday night, Tara picked out the pink salwar kameez she would wear to the mela tomorrow. Every evening, while Shyama cooked the evening meal, Tara listened to her niece’s narration of the goings-on at the mela. Photograph: Wikimedia Commons. Shyama’s description hadn’t prepared Tara for the enormity of the mela. It keeps getting bigger every year. The ground was packed with tents that held pillow covers and bedsheets, bangles of glass and plastic and metal, potted plants and strings of lights, yards of fabric and readymade kurtas, jackets and sweaters, socks and scarves. Tara made her way to the stall selling raffle tickets. In the corner, standing out despite their attempt to blend in by donning local attire, were the foreigners, yellow-haired, blue-eyed, and very, very tall. How peculiar, Tara thought, that they are constantly smiling. “Namaste,” the tall, white girl said. Tara looked to where the woman pointed. On the two chairs sat the back sat two villagers, one of whom Tara recognised. Large headphones covered their ears. A large tent in the centre of the ground held a performance area. Tara sat down on the green felt, joining a cluster of women already engrossed in the dance on stage. Girls, whose bodies had widened, whose flesh now glowed from the inception of womanhood, danced on Bollywood songs. They gyrated and swayed, performing in ways society wouldn’t otherwise allow. Someday they will be able to dance freely, free of a stage. She remembered her own childhood, when she danced under the downpour of the first rainfall of the season. How she had enjoyed jumping in the wetness, her body slippery and wet, like a fish. That was a long time ago, when Tara believed she could be anything and anyone, even a fish. Now, glueing her eyes on the confident young women in front of her, Tara knew better. The performance ended with great applause. The next performer wasn’t nearly as confident or prepared. She was more beautiful, more kempt in her demeanour, more rigid, lacking grace. Her hair puffed up at the top and smoothly folded under a large, well-placed clip. “What?” Tara turned towards the voice behind her. Sure enough, the girl’s black chiffon dupatta, cautiously draped over her right shoulder, slipped off, and in between movements the girl flicked it back up her shoulder. This happened a few times until the girl slung the dupatta around her neck, the ends dangling on either side of her knees. “Smart move,” muttered the woman behind Tara. “I got married.” She tapped at the red vermillion striped down the parting in her hair. Petite in frame, high pitched in voice, Pooja appeared no older than the dancer on stage. “That was two years ago,” Pooja continued, “now I have a child, he’s barely one. Plus, I have to take care of my mother-in-law.” Pooja sighed. “It’s so hard to lift her, because she’s quite heavy, and my sister-in-law used to help me but now she’s gone off to live in the big town.” The girl appeared distressed. This young woman was married ten years after me, and yet it seems she got hitched at the same age I did. I did not even pass tenth, and yet this girl, who is more educated than I am, has no one to help her. She’s lost and alone. “Where is the time,” Pooja wailed over the loud music of the next performance, “The child takes up most of my time. He’s with his father now, thank goodness.” Tara thought it strange how Pooja referred to the child not as ‘my child’ but ‘the child’. She thought of Shyama and resolved to let the girl study as much as she could. The two women joined the others on stage, grabbing each other’s forearms as they formed an inner and outer circle. Younger girls in jeans, older women in saris, and those in the middle, like Tara, in salwar kameez, moved two steps forward, one step back, then forward again, to the rhythm of the words crooned by an old, hunchbacked, sari-clad amma. There were many dances that Tara had forgotten with time, many choices she had forsaken, but this, the jhoda, was a dance that she allowed herself. * Buffalo’s calf; an abusive term. ** Chauhan, Trepan Singh, and Purabi Panwar. Kumaoni Language and Literature. Indian Literature, vol. 46, no. 2 (208), 2002, pp. 108–113. JSTOR.